This classic text, now in its fifth edition, combines thorough coverage of the basic principles of civil engineering hydraulics with a wide-ranging treatment of practical, real world applications. It is carefully structured into two parts to deal with principles before moving on to more advanced topics. The first part focuses on fundamentals, including hydrostatics, hydrodynamics, pipe and open channel flow, wave theory, physical modelling, hydrology and sediment transport. 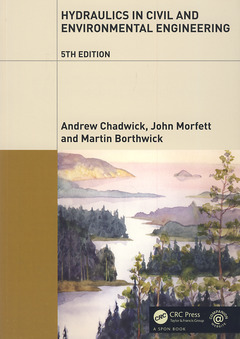 The second part illustrates the engineering applications of these fundamental principles to pipeline system design, hydraulic structures, river and coastal engineering, including up-to-date environmental implications and a chapter on computational modelling, illustrating the application of computational simulation techniques to modern design, in a variety of contexts. This edition includes substantive revisions of the chapters on hydraulic machines, flood hydrology and computational modelling. New material has also been added to the chapters on hydrostatics, principles of fluid flow, behaviour of real fluids, open channel flow, pressure surge in pipelines, wave theory, sediment transport, river engineering and coastal engineering. The latest recommendations regarding climate change predictions, impacts and adaptation measures are also included. Updating of necessary references has been undertaken throughout. Hydraulics in Civil and Environmental Engineering is an essential resource for students and practitioners of civil, environmental and public health engineering, and associated disciplines. It is comprehensive, fully illustrated and contains many examples. A solutions manual, spreadsheet listings and useful links to other web pages are available on an accompanying website. Undergraduates and graduate students in civil engineering and environmental engineering, particularly courses in hydraulic engineering and coastal engineering.